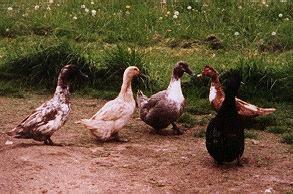 (Left)Here's our original gang: Blue Swede x Buff, Buff, Blue Swede, Brown Muscovy, and Cayuga drake in foreground. 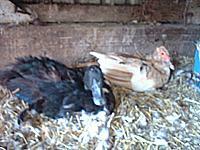 From these guys plus 3 Pekins and a pair of Rouens, all our current ducks are descended. We started because we liked ducks, wanted to have them around. Then came the population explosion. Recently we've sold a lot and things are saner. 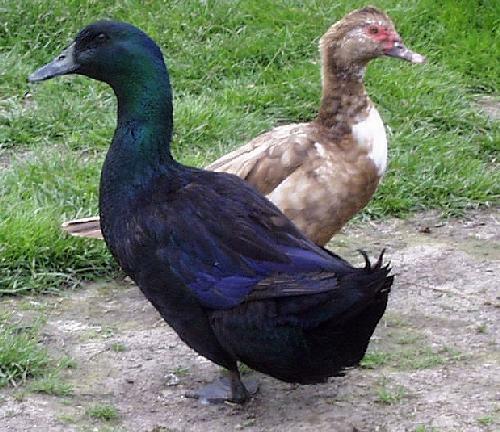 (Below Right)Here's a better picture of the Cayuga drake, with the brown Muscovy. We still have her, and you can see a photo of her setting eggs (Below left), in a co-operative arrangement with a Cayuga/Pekin cross. 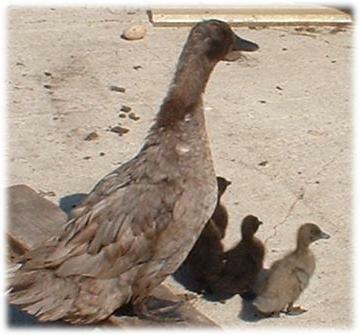 (Left)Cross-bred Cayuga/Blue Swede ducklings. As you can see, some came out looking like Cayugas, some like Blue Swedes. But as they grew most of the black Cayugas had lighter markings. These were hatched in an incubator, as their young Moms showed no interest in doing the job. 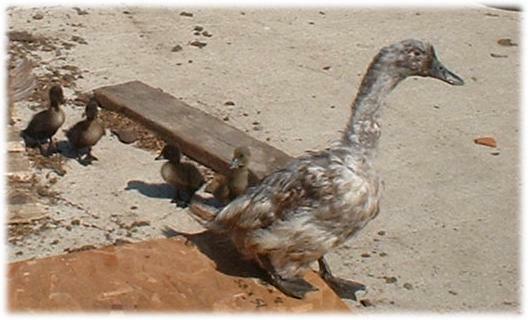 We were told that hatching duck eggs was difficult, but we had a very good hatch rate. I believe the secret to be to flick water onto the eggs daily, just as if Mom had been for a swim and come back wet. The shells need that extra moisture in order for the ducklings to break out of them when the time comes. Luckily some ducks are better Mothers. We no longer incubate duck eggs as we have several ladies who produce ducklings for us each year, in fact we rather wish they'd stop! Below you can see two pictures of one of our barnyard families. 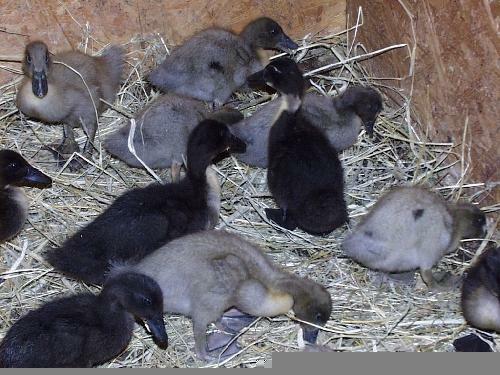 Mom was actually one of the Blue Swede coloured ducklings seen on the left.